My first pass at this composition was last Saturday, and it just wasn't right, not the perspective or the various whites. So I wiped it off, got the basic shapes right, and let it sit through the two previously posted paintings. I knew what was wrong, and this time, I got something I like. I love New Years, making resolutions, like making plans, is one of my favorite things to do. So take this cup of tea, think of all you learned in 2009, and make your plans for the new year. I look forward to being part of some of them. Happy New Year! 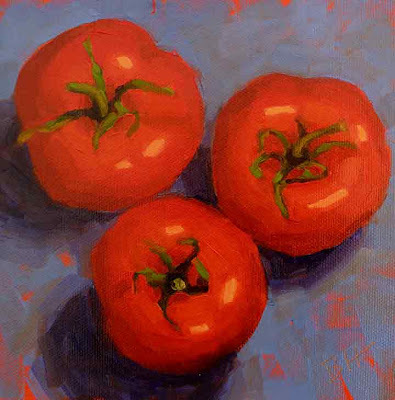 I have been experimenting with backgrounds and really like the bright red tomatoes on this blue, with some of the red underpainting showing through. Very cheerful for a winter's day! This time of the year I crave oranges, clementines, lemons, limes, and grapefruit; sunshine with a peel! Here's a selection on a surf colored background to get you thinking about summer, or maybe just that trip to Florida that you're planning. 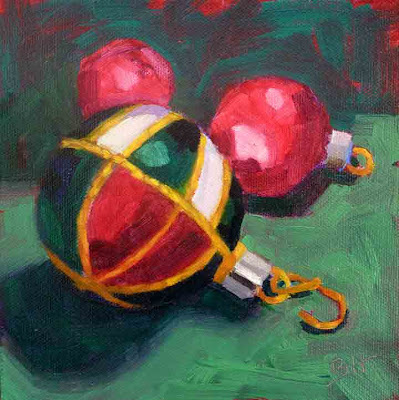 "Ornaments" and a Merry Christmas! Merry Christmas! I hope you all have a most wonderful holiday. 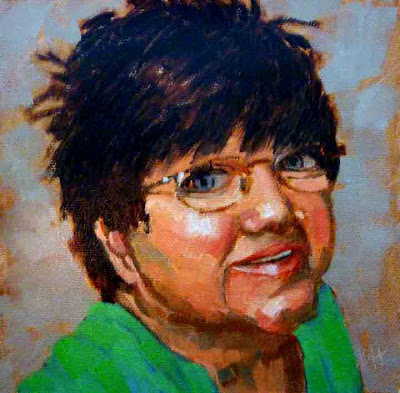 This portrait is my entry in Karin Jurick's current challenge on her Different Strokes From Different Folks blog. 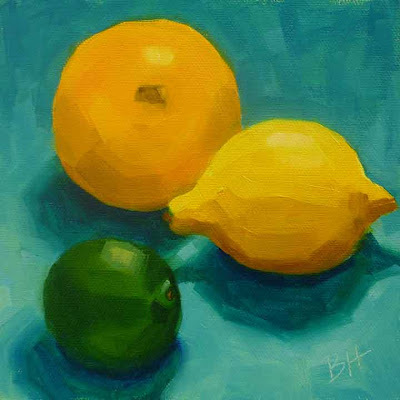 On this blog Karin posts a new photo every three weeks and challenges artists to paint, draw, or etch it their way. 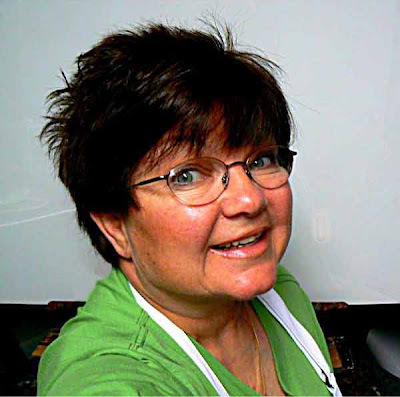 Each year at the holidays, the challenge is a portrait of another artist, with Karin giving out the assignments. This is the first time I have participated, though I did David Lobenberg's self portrait challenge in August. It is definitely easier to paint someone from a photograph, than to paint while looking at yourself in the mirror! 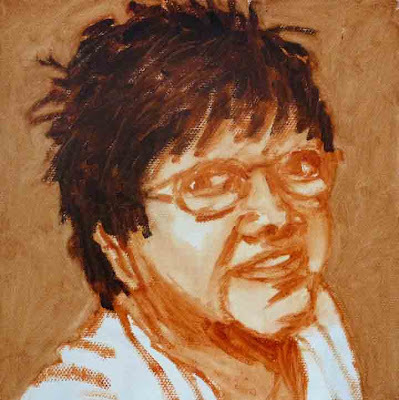 I am editing this post (Tuesday evening) to add a process photo of Carol's portrait as well as her photograph, now that we are paired on the DSFDF blog. I don't always do a value sketch as an underpainting, but for something as complex as a portrait I think it helps keep the features in the right place. You can see that I hadn't quite gotten Carol's expression in the value sketch, and so I adjusted her smile when I applied the color layer. "A Spoon Full of Sugar"
This painting was inspired by a gouache study I did in my first week of daily painting last February, a piece that I was very pleased with. The subject is a butter dish from Chipping Campden Pottery in England, that I bought on a visit there with a good friend many years ago. We have always used it as a sugar bowl. Just like the first time, this one pretty much fell off the brush, and I was happy with it all the while I was working. I do think there is something about one's pleasure with the subject that makes the painting more like fun and less like work. But do we learn more from the ones that are more like work? I'm not sure. 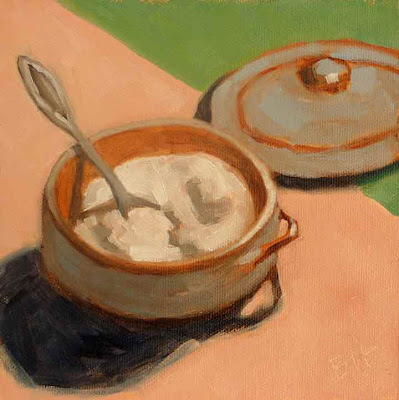 If you haven't noticed the new gadget on the right side of this blog, it is from the Daily Painters International Art Gallery, which I recently joined. 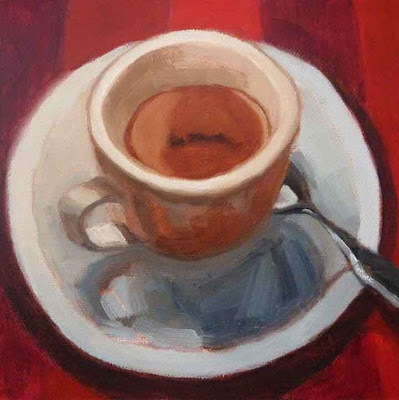 Welcome to visitors who have found my blog through this great group of international artists! Click through the recent posts with the buttons at the bottom of the gadget, or take a look at the DPIAG site, by clicking on the link in the gadget. 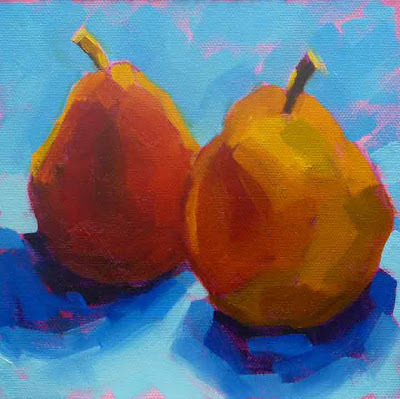 The pears return to do their part in this exercise I am considering for the upcoming daily painting and blogging workshop January 23rd and 30th in Damariscotta, ME at River Arts. 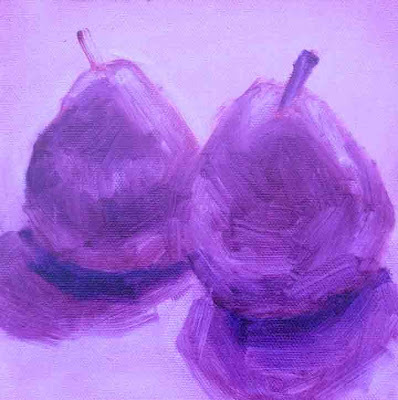 The pears were blocked in as a value study, left to dry and then overpainted with color using a limited palette. See previous post, where tomatoes had their turn. These pears were really fabulous, and lasted a couple of weeks. 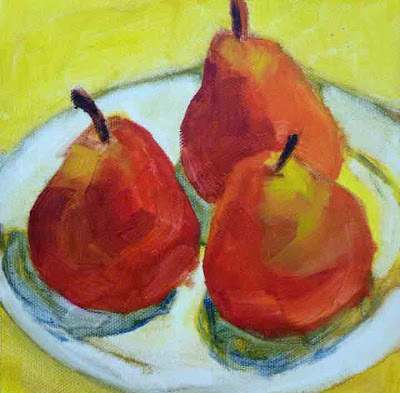 I did another painting of them, "Pears on a Plate", almost two weeks ago. By the time the study above was complete, they had been under the lights for hours, but we ate them anyway, and they were delicious. 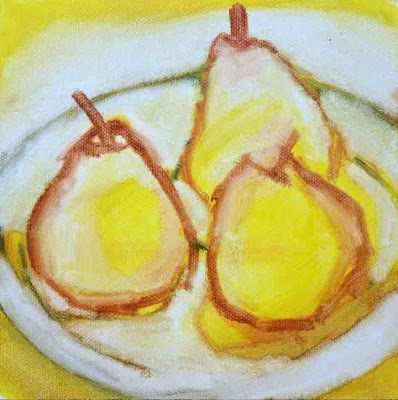 Which painting do you prefer: "Pears in Blue" or "Pears on a Plate"? And finally, I want to congratulate Sally Dean, who is the winner of my November Painting Giveaway. Sally will receive "Porter's Pine". Do visit Sally's blog at Sally Dean 365 Flowers. This is another potential exercise for the Daily Painting and Blogging Workshop I will be teaching at River Arts next month. The idea is to do a value sketch on a toned canvas and then go back with color to complete the painting. The value sketch should be done very quickly, this one probably took me ten minutes. But that doesn't count the first two passes that I wiped off! I'll have to keep practicing to get the second phase down to the 45 minutes I would like it take for the workshop. For more information on the workshop click here and look for my name. 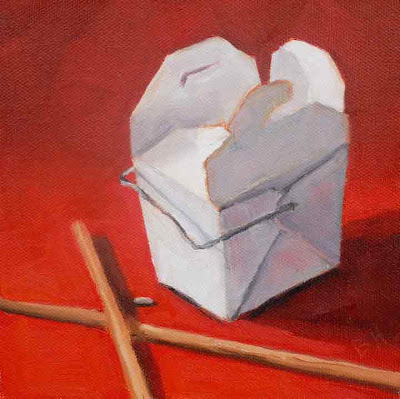 Continuing the red theme, when I put this takeout container down next to a red napkin, I wondered what would complete the composition. The chopsticks were perfect. Can you tell what was in the takeout box? Today was a busy day, with the opening at the Yarmouth Frameshop and Gallery, plus visits with friends in town for the weekend. 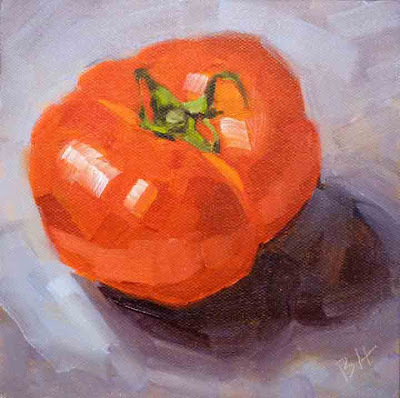 I was looking for something relatively simple to paint, and this gorgeous beefsteak tomato fit the bill. As someone said to me at the opening, if you think about a tomato, it doesn't feel the same way as an apple despite the similarity in color. 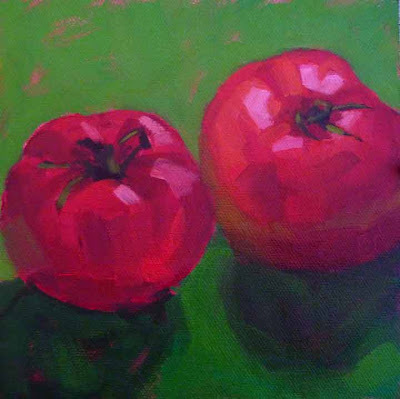 To me a tomato has heft, it feels like you can pick it up and throw it (not that I don't love to eat them! 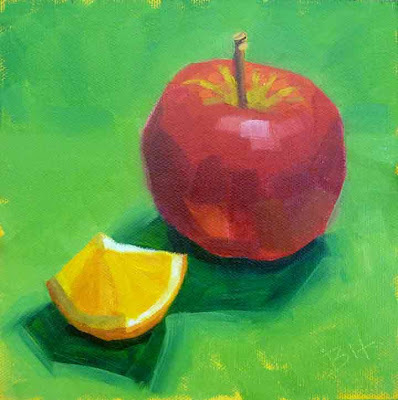 ), while an apple is about crispness, and picking it up and taking a bite. Can you feel the weight of this tomato? I've included two process photos as well as the finished painting. The middle photo is my drawing on what was originally a yellow ground, but in getting the elipse of the plate right (see the April 4 post on this page from Carol Marine) some of it got wiped off. I kind of like this though. 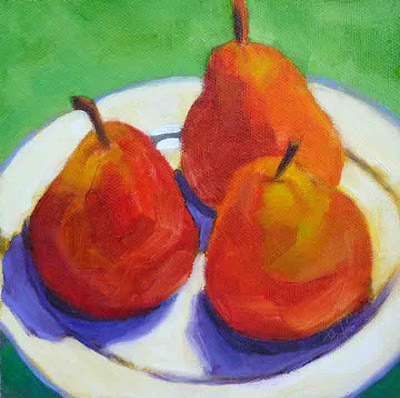 The bottom photo has the first pass on the pears and shadows, but the plate and background are still mostly untouched. 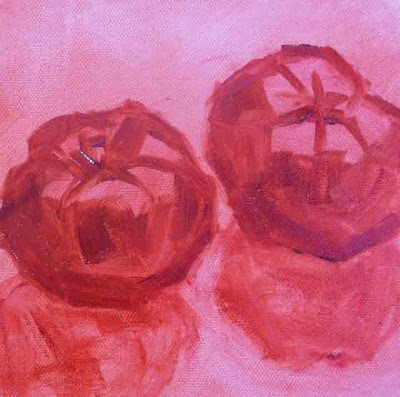 For this painting, the pears didn't change much in the final pass. Color differences are due to the bottom two photos being taken in the studio, while the final was taken outside.